Odissi dance originated in the temples of Orissa (East India) and was performed as an offering and means of worship. This devotional dance has been passed on from guru to disciple for over 2,000 years, making it the oldest known temple dance still in practice. This style of Classical Indian Dance is praised for having distinctly feminine postures, with exaggerated hip curvatures and graceful movements of the torso, counter balancing Odissi strong rhythmic footwork. The stepping exercises Choka 1-10 were created by the great Gurus of the Odissi style to build strength, coordination and rhythm sense. This Vol. 1 DVD offers students a study tool for practicing stepping in the choka posture of Odissi dance. Each stepping exercise is broken down carefully and performed at three speeds. 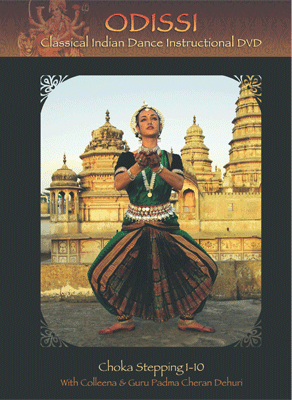 This DVD is filmed on location at Shakti School of Dance (Pushkar, India) within the beautiful Rangji temple complex. Includes: -A brief history of Odissi classical dance. -Two prayers to use at the beginning of your dance practice. -Choka 1-10 Stepping Exercises with breakdown of steps into upper body and lower body. -Two bonus chapters on: one handed and two handed mudras. -Live performance section with various performances by Colleena Shakti in India and the USA! I use this DVD for my weekly moving meditations. The sequence of Chokas are both challenging and in the stages (kramas) shown easy to follow. I find the sequence of mudras very healing and inspirational. Colleena and her guru are outstanding.